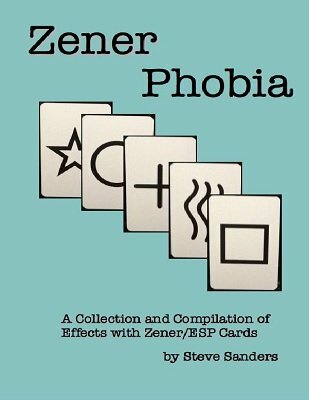 ZenerPhobia is a compilation and collection of ten effects that can be done with a Zener deck or as it is more commonly known the ESP deck. An introduction to the symbols and a brief description of the Piatnik and Royal Magic ESP decks and their little known secrets. A spectator uses her inane ESP powers to predict whether five unseen cards will match another five unseen cards. The deck of twenty five ESP cards are shuffled. The magician announces that in most 'magic tricks' the magician does not reveal the outcome, but, as this is a demonstration of clairvoyance he will state categorically what symbol will be chosen and does so... Dealing the cards onto the table the spectator stops him at any time. The symbol on the card is the same as the one predicted. Two Spectators have their minds read at a distance. Three cards chosen by three spectators are divined by use of the spectators' characters. The mystic seer has a spectator send the symbol to him by means of telepathy. The spectator's choice of symbol is gleaned by ESP or is the spectator just very bad at bluffing? A perfectly free choice from five cards is predicted as the chosen card is different from the other four. A classic effect where after putting his card on the table first each time, each of the magician's cards is matched perfectly by the spectator. Using twelve cards each, between them, the magician and a spectator find out the unknown symbol. 1st edition 2015, 15 pages.